Summon: Falling Wizard deals 5 damage to himself. Falling Wizard is an epic Intelligence creature card. It is part of the Houses of Morrowind expansion. "I can't believe I'm still alive!" 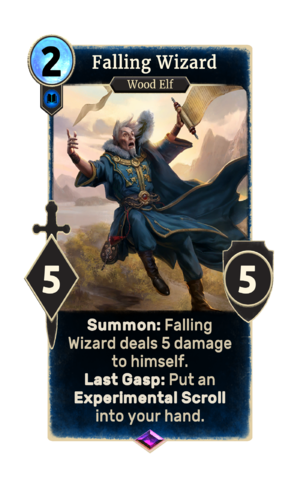 This card depicts Tarhiel and is named after the quest A Falling Wizard from Morrowind. Similar to this card, he will fall to his death (if not saved) and carries some unique scrolls that can be looted from his body. This page was last modified on 1 March 2019, at 23:51.